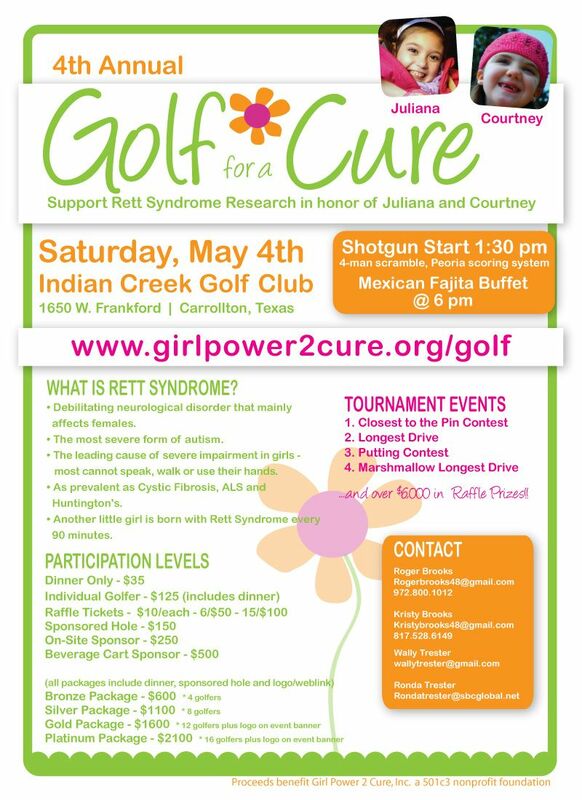 The 4th Annual Golf for a Cure at Indian Creek Golf Club in Carrollton will be held on May 4, 2013. This 4-man scramble, Peoria scoring system format is open to both the experienced and novice golfers. Proceeds benefit Rett Syndrome research coordinated by the Rett Syndrome Research Trust out of Trumble, CT. Sponsored by Girl Power 2 Cure, an organization dedicated to raising awareness and funding for Rett Syndrome research. Rett Syndrome affects more than a half million girls and women worldwide and specifically, two special little girls here in DFW- Juliana Brooks and Courtney Trester. Shotgun start at 1:30pm followed by a raffle and dinner. Non-golfers can purchase tickets for the dinner which starts at 6:00 pm. To reserve your space as a player, sponsor or for dinner, go to www.girlpower2cure.org/golf.